I had the pleasure of speaking to one of our 50Legs family members, Naudy. Naudy is an amazing person whose amputation is a rarity. He has had an amputation above the knee- taking his whole leg from him. There is a 10% chance in the USA of having a full leg amputation. It is extremely uncommon and what’s more uncommon is that in the USA a cancer amputation is 1% of all amputations per year according to the Amputation Coalition website. Naudy told me he had an Osteosarcoma of the leg. This is a tumor in your bone that can spread to the rest of your body if not handled appropriately. “It was a weird feeling to wake up and think there was nothing there at all…it felt like my leg was numb…like I could still use my feet and toes, but nothing physically was there. It was a numb feeling for a long time there…almost like your arm falls asleep.” The doctor told him that unfortunately, they had to take the whole leg for fear of the cancer spreading and even after the amputation he had to go through more chemo treatments. Naudy originally was given a prosthesis that holds him by the stomach and gives him a leg to walk on. However, Naudy found it very difficult to walk with, because it was too heavy for him. Not only was it heavy, but it hurt. It was physically painful and the few times he did use it, the prosthesis broke. He finally gave up on ever having anything close to a leg again. He consistently used crutches for 15 years. Naudy was talking to his friend one day and his friend was helping him look for a place to help Naudy find a better prosthesis. 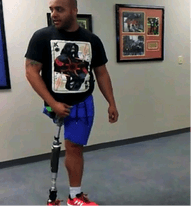 He had gotten used to crutches, but it was time to learn how to walk again. 50Legs was one of the choices and his friend looked into the organization. They learned about the partnership between 50Legs and POA. Naudy was nervous because he didn’t know what to expect. He got a call back right away from 50Legs, something he would have had to have waited months to years for at other organizations. He was shocked, but happy at the same time. When he went to POA to get his prosthesis and learn to walk he was still a little unsure of what to expect with the process. A POA worker, John, showed him a video of someone just like himself walking with the prosthesis Naudy was there to get. John explained that it’s going to be tough to learn balance again with this, but you will be able to walk like this man in the video. Naudy told me, “Everyone at POA is so nice and they make you feel like you are family. Everyone there is laughing and having a good time. It’s not like a hospital at all. They even bring in dogs to the physical therapy area. Where else can you get that?” Naudy also explained to me that he is still getting used to his prosthesis because he was on crutches for so long it’s hard to get used to walking again. “My balance is off…I realized that I forgot how to walk. I forgot how to synchronize my arms with my legs. I forgot that you even need to move your arms to walk…I’m getting used to this again.” We chatted about this for a while and decided that it’s like when you ride a bike. When you are learning to ride a bike without training wheels it’s hard to balance and get the hang of it. It’s the same thing with getting a new leg. It’s something that takes time and practice to get used to again. Despite all the adversity Naudy is bravely learning to walk again. Since he had been through so much I asked him if there is one thing he could tell a person going through the same thing he went through and what it would be? ?While Naudy is learning to walk again and adapting to his new prosthesis we both want everyone reading this to know it’s better to be here than not to be here at all. Don’t let fear hold you back. Just like trying to ride a bike it can be scary at first, but in the end, it’s nothing to be scared about. It’s something to be embraced.